Between the 25th and 26th of July 2014, the Andrey & Julia Dashin’s Foundation is set to take an active part in supporting a charity fundraising campaign during the 2nd Riverstock Music Festival in Limassol. The biggest music festival this summer is due to take place in Limassol, Potamos Germasogeias parking venue, and is due to attract tens of thousands of spectators and Greek rock-music fans. Famous music performers, together with the Greek music legend Vasilis Papakonstantinou, shall gather during the festival to play for charity! The event starts at 19:30 on both Friday and Saturday. 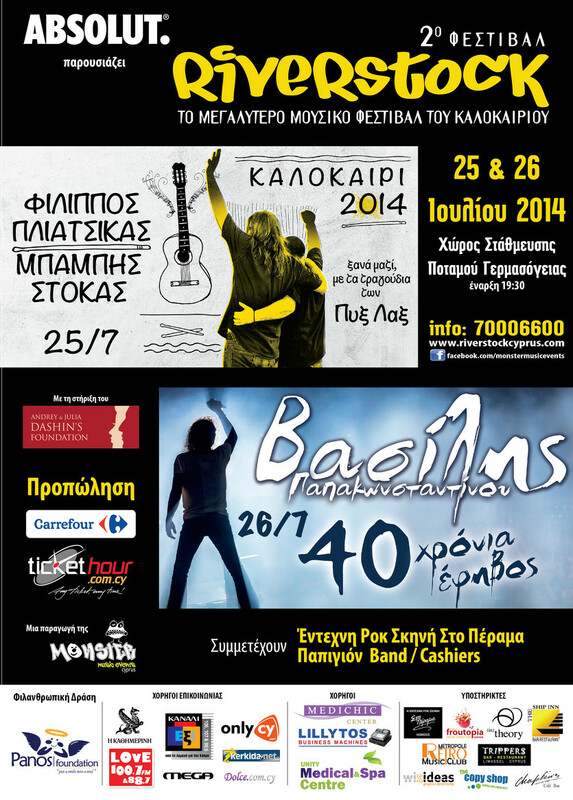 All proceeds collected from ticket sales will be donated to the Panos Evripidou Foundation. The Panos Evripidou Foundation is dedicated to the improvement of the lives of prematurely born children facing life-long challenges caused by prematurity after leaving the N.I.C.U. Their primary goal is to help and support the children’s families through education and financial assistance where possible and needed, and to enhance the physical, emotional, and social well-being of children and families in need. We invite all our friends, partners, colleagues and volunteers to come and join us in this charitable cause to help raise more funds and increase further awareness! The ticket price to attend one of the days of the event is €18 per person and to attend both days only €25. Tickets can be bought at any Carrefour store branch near you, or via the website shop.tickethour.com. Come and join the party with plenty of great food and drinks, and enjoy your favourite music with us!